Yoho National Park is a lesser-known gem in the Canadian Rockies. 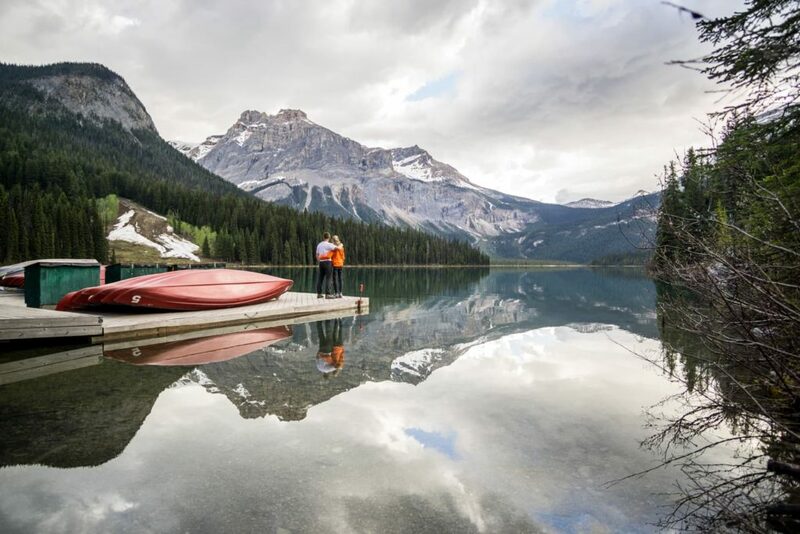 While most people flock to its famous neighbours Banff and Jasper National Parks, Yoho is often overlooked and together in collaboration with Expedia.ca, we’ll show you why it shouldn’t be and where to stay. 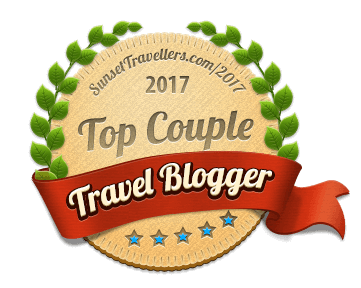 It is an ideal destination for hikers, nature lovers, road trippers and all around adventurers. We like to visit Yoho National Park all year round. Many trails are great for cross-country skiing in winter, and we can go exploring countless waterfalls, lakes and hiking trails in summer. Start planning your weekend getaway with our post. You will find here everything you need to know for a great trip in the Canadian outdoors! Yoho National Park sits on the east side of the British Columbia province. 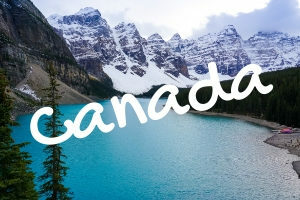 Its neighbours are Banff, Jasper and Kootenay National Park. The Trans-Canada Highway passes through the national park and its main center, a little town Field where you can find the visitor centre. 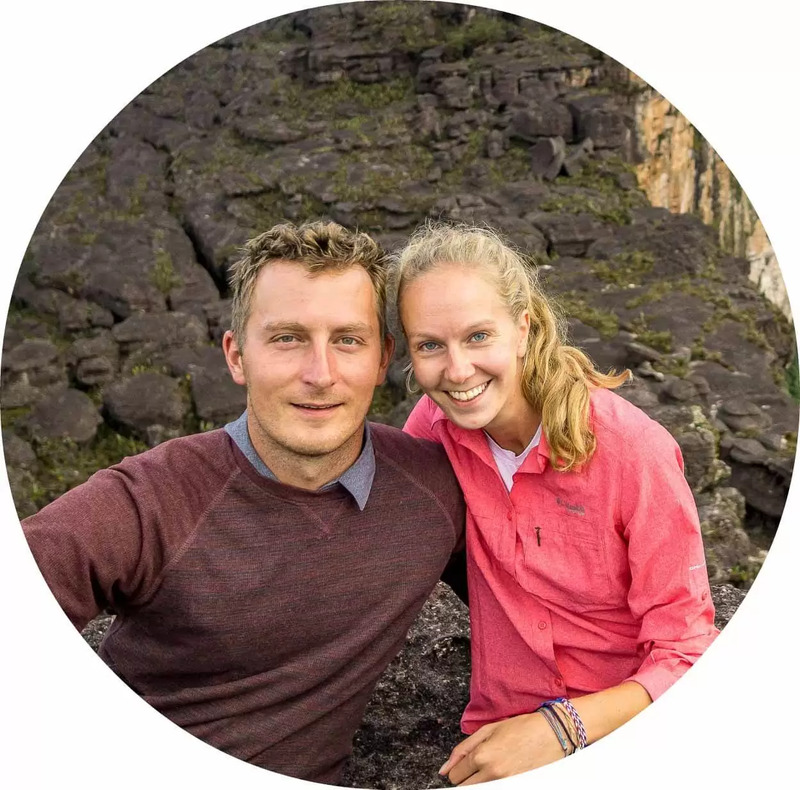 The staff can help you book your accommodation and provide tips and maps for Yoho and surrounding parks. 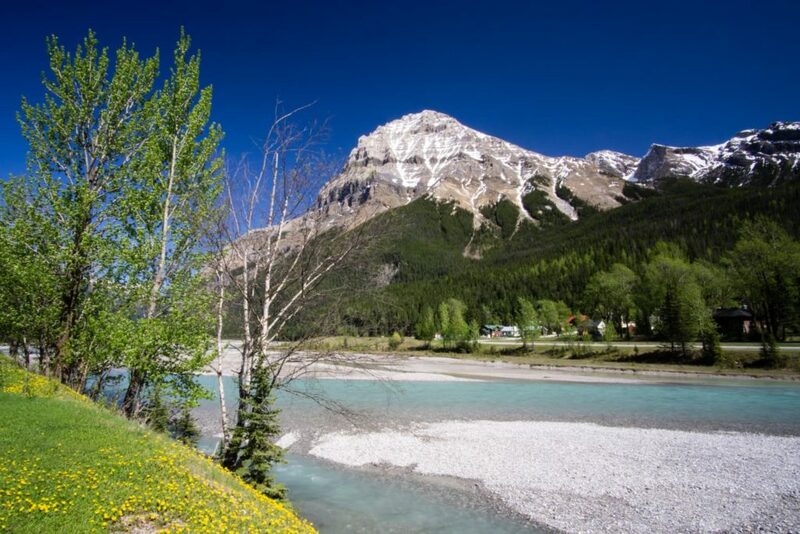 Campgrounds Kicking Horse, Monarch, Takakkaw Falls and Hoodoo Creek. They are available from mid-May to mid-October and operate on a first-come first-serve basis, so plan to arrive early. Mid-range options can be found in Field which has several guesthouses. Luxury options include:The Gread Divide Lodge, Cathedral Mountain Lodge and Emerald Lake Lodge. Check out Expedia.ca for accommodation options. 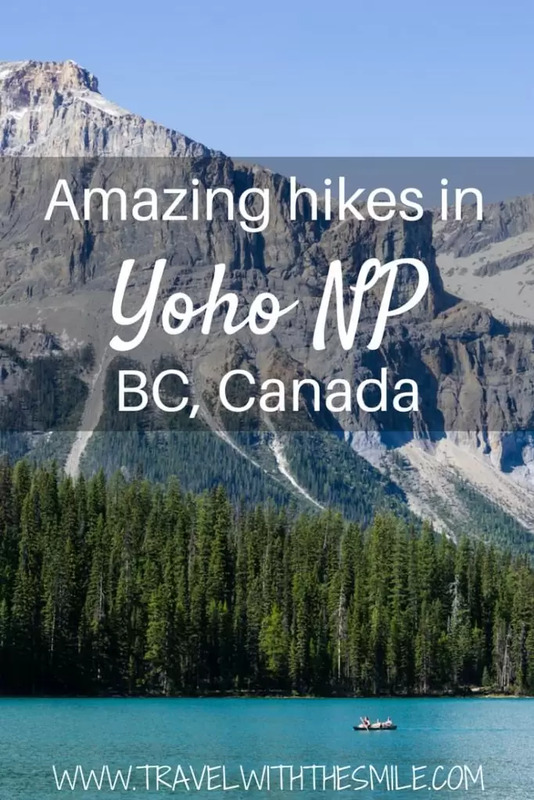 You can visit Yoho National Park all year round. 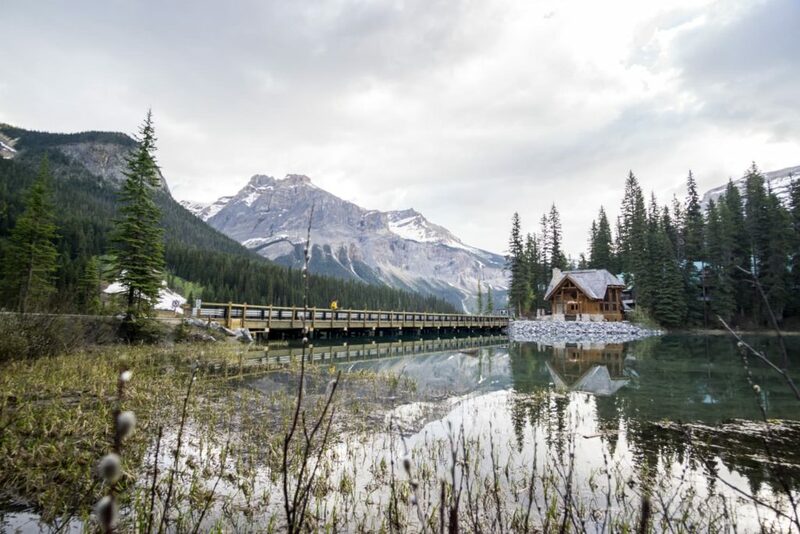 In winter, you can base yourself at Emerald Lake Lodge, go cross country skiing or snowshoeing and see the frozen waterfall at Natural Bridge. The main season starts mid-May (or end of May) and ends mid-October. During this time the campgrounds and roads are open with just a few hiking trails closed due to grizzly bear presence. 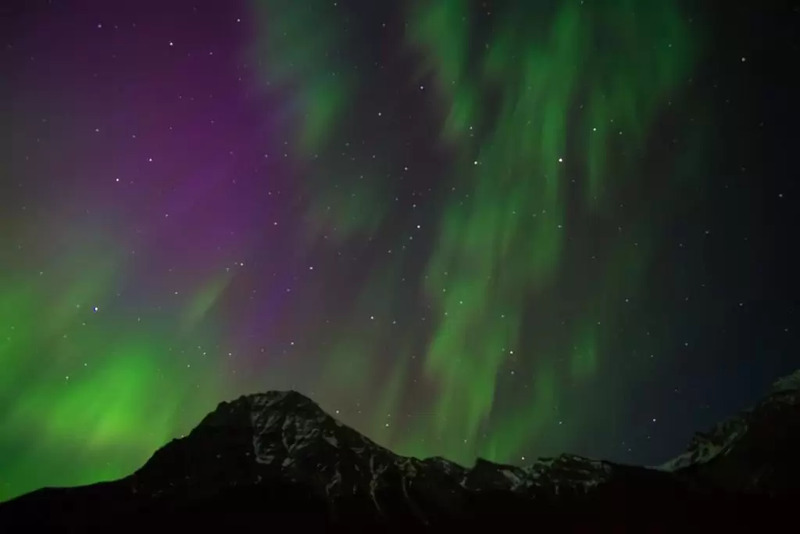 The peak season is in July and August, same as the rest of the Canadian Rockies. We’ve visited at the end of May and while camping was fine, lots of trails were covered in snow. I would recommend planning a trip to Yoho in June or in September. Check this website for up to date closures in the park. Basic campground per night starts at 15,70CAD while backcountry camping costs 9,80CAD per person. All passes and camping permits can be purchased at the visitor center in Field, Banff or Jasper. 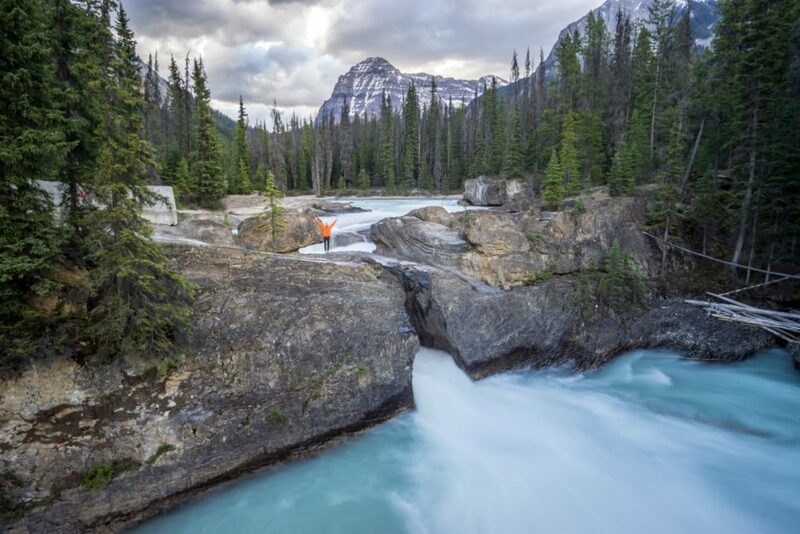 Only 17km from Field, this is the most popular place in Yoho National Park. It’s easily reachable by car with a short walk to the base of the falls. 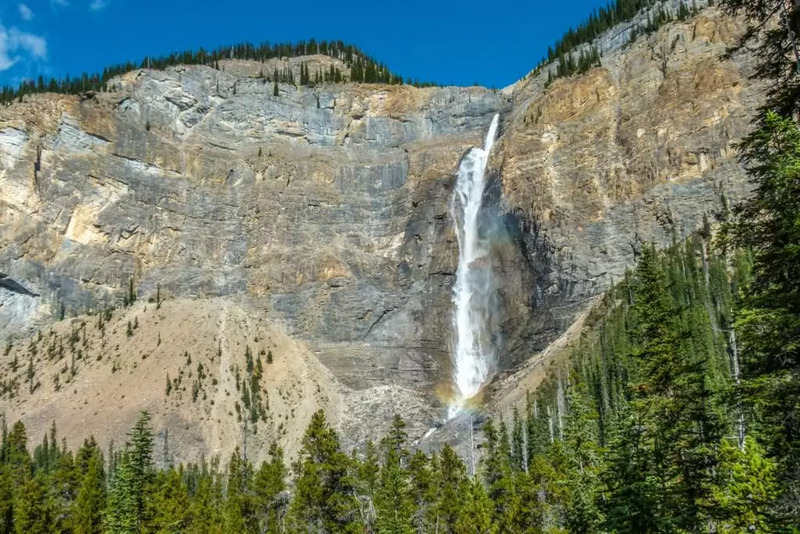 For rock climbers, there is a route on the left side of the falls.Takakkaw Falls are 300 meters high, also have a campground and short hikes in the area. 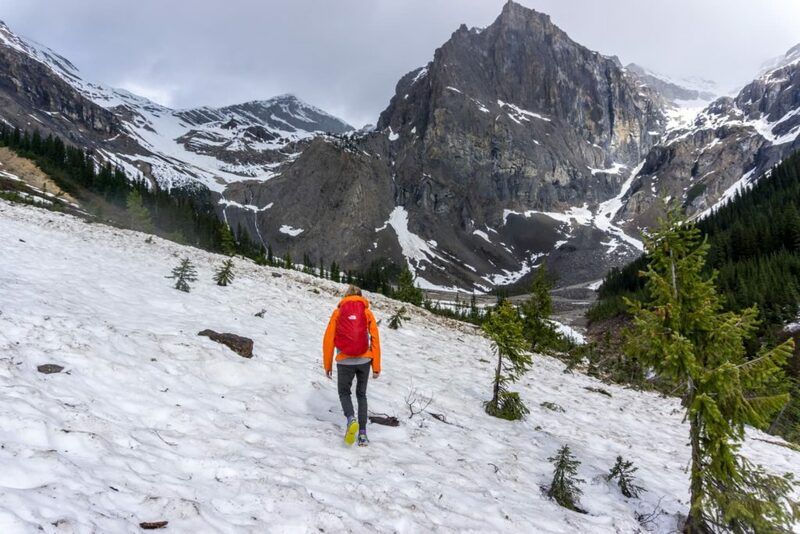 Yoho Valley Road leading to the waterfalls is closed October 10 – mid-June due to avalanche risk. Short and easy hike leads to a huge waterfall which can be visited year round. It is 5km long (return) if the gate is open. If it’s closed, you’ll park a little further and the hike will be 8km long (return). It’s mostly flat until you arrive to the upper viewpoint, then a short hike down the hill and you’ll arrive at the base. 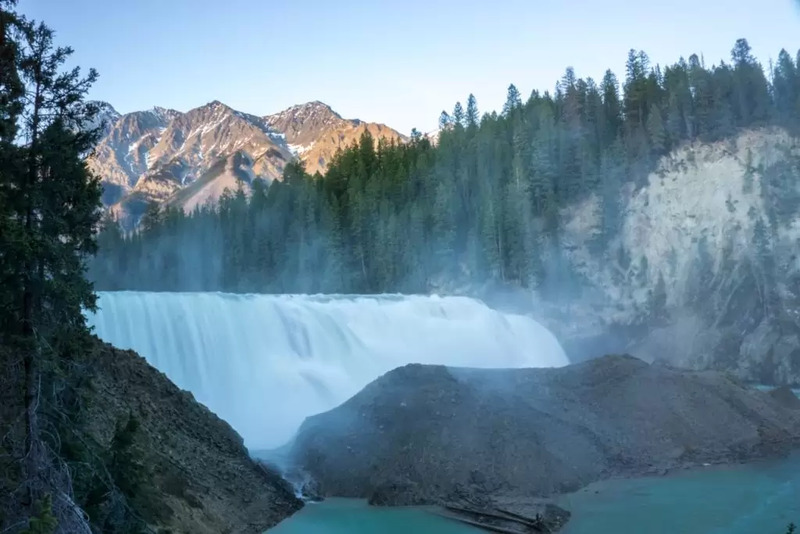 Wapta Falls are located near the west edge of the park, approximately 25 km from Field. You will see the parking lot on the left side after you cross the Kicking Horse River (the sign for the parking lot is on the other side of the road, if you’re coming from Field). During peak summer season, it is a very busy trail. It’s 4,5km long, flat and goes around the whole Emerald Lake. Great way to admire the views is also renting a canoe on the lake. On the north end side of the lake is a signed trail to the Emerald Basin which leads closer to the Emerald Glacier. 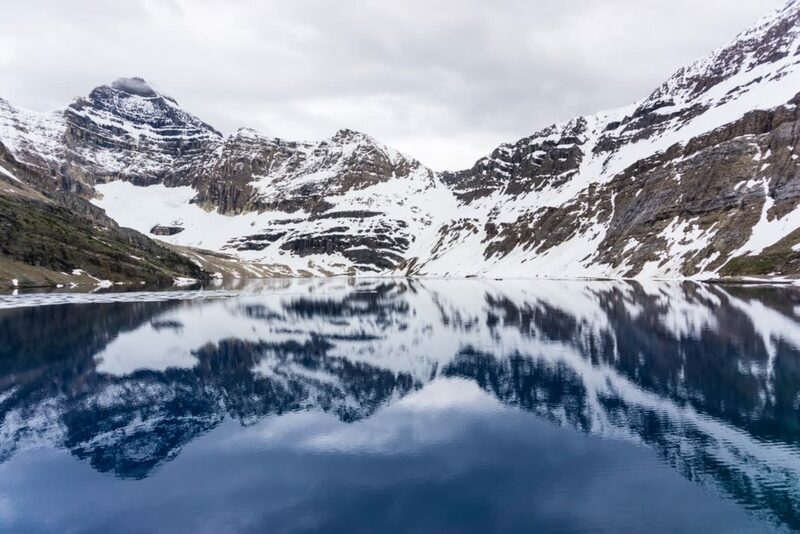 It is flat along the lake, then climbs and enters the forest and finally opens up at the Emerald Basin with a view of The President, The Vice President, Michael Peak and Emerald glacier right in front of you. We got as closer as we could, the trail was difficult to locate as we were walking on the remaining parts of the snow. A true gem of the Yoho National Park. 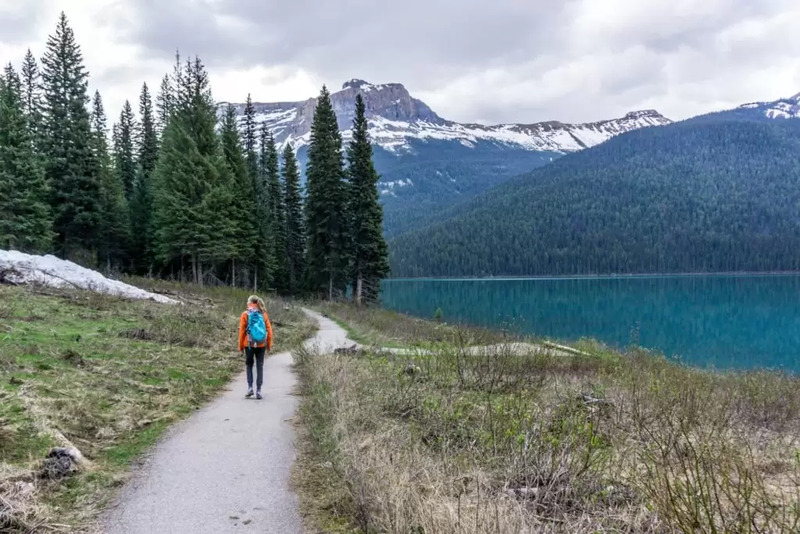 The area around Lake O’Hara has several hiking trails ranging in difficulties and views of several stunning lakes. The 12km dirt road to the lake is only accessible by shuttle bus which can be booked by phone (details here)for a day trip or overnight stay. 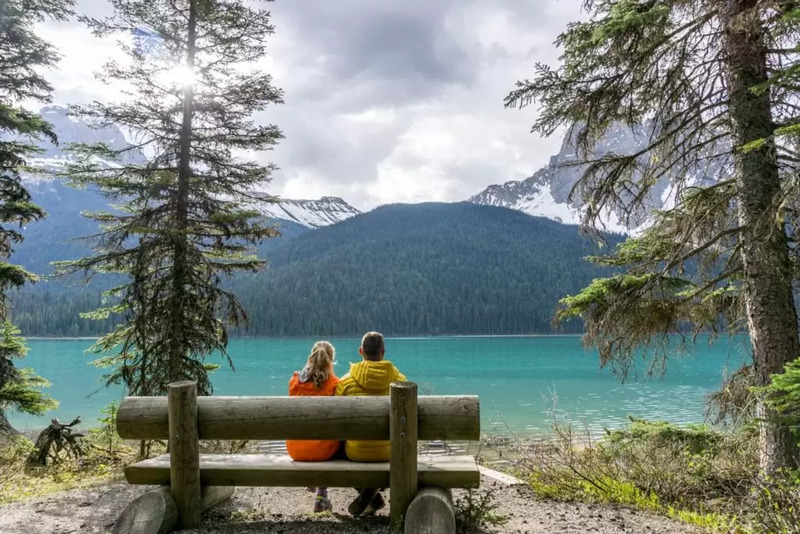 Accommodation options include either a campground (which is usually fully booked 3 months in advance, so prepare your dates very early) or in a Lake O’Hara Lodge. These are areas where we’ve hiked before and know well. 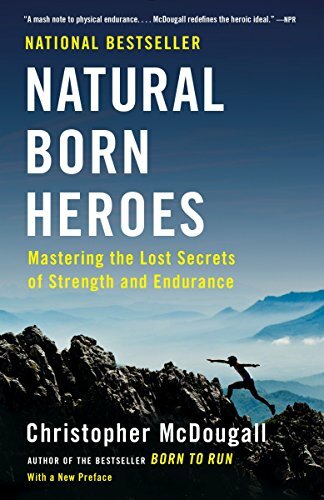 If you would like to go hiking even more, read this website or this one. Natural Bridge – can be visited year round. It is located a few kilometres from Field on the way to the Emerald Lake. You can watch the bustling Kicking Horse River make its way through the limestone rock beds from a several viewing points. Kicking Horse River white water rafting – a few rafting companies in Golden, BC offer this exhilarating experience and it’s one of the best places for white water rafting in Canada. Stand up paddle board to Wapta Falls – rafting company in Golden, BC (60 km from Field) offers this trip. 5 hours on stand up paddle board surrounded by mountains sounds great to me. 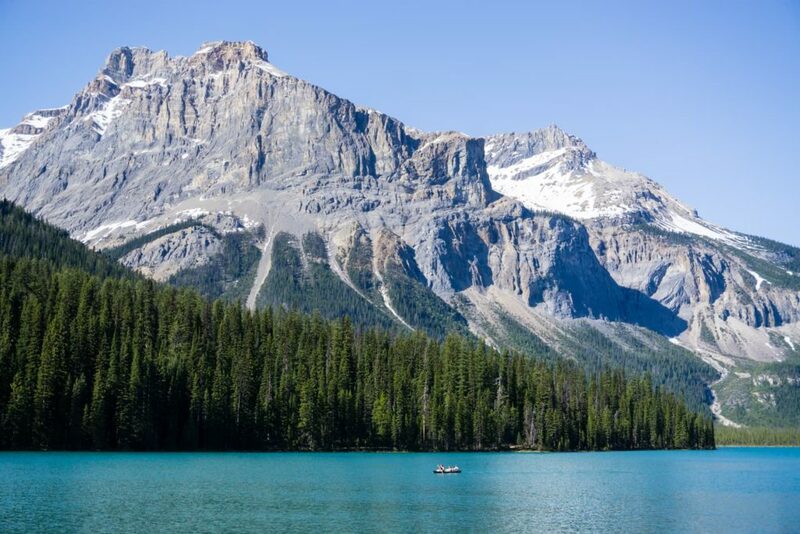 Enjoy your trip to Yoho National Park and let us know what you enjoyed the most.